Choosing candy wedding favors is actually not an easy task. 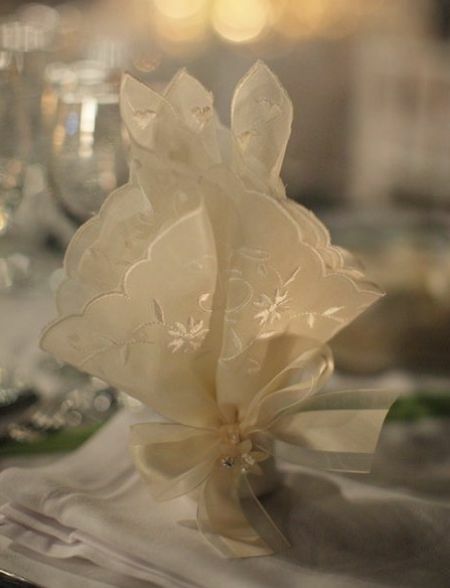 Just as you do with your gown or wedding cake, you will spend a lot of time searching for favors that reflect your style and preference. Fortunately, the array of favors has never been more versatile or inventive. 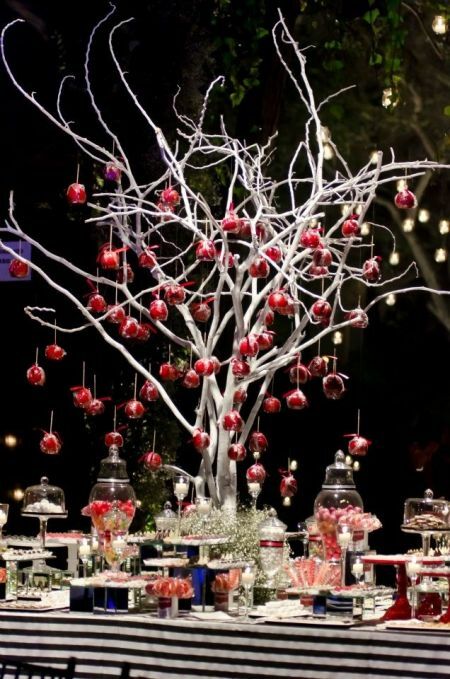 Featured here are favor choices that range from extravagant ideas such as candy apple trees to simpler ideas such as a pretty handkerchief filled with Jordan almonds. 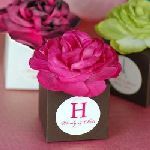 These simple, pretty, and imaginative candy wedding favors will bring a sweet dash of originality to your big day. 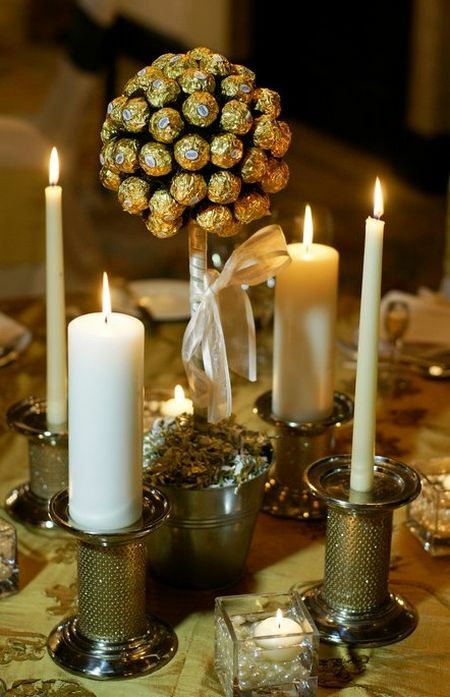 Candy is a wedding favor mainstay, especially when you want to gift a large number of guests easily. 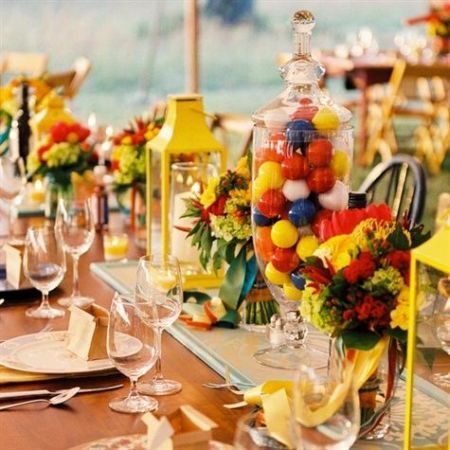 One of the most popular ideas is the wedding candy buffet, incorporating all your candy favorites in one visually impressive display. Ideas for candy wedding favors abound, reflecting the best of the best. We hope you enjoy these incredibly creative ideas. Candy wedding favors to make it easy to celebrate how sweet it is. The way you display your wedding candy bar can be as important as the candy itself. With just a little thought and imagination, candy buffets can be an easy way to add color and texture to your wedding reception. We love the use of various shapes and sizes of vessels. The overall design and ease of serving is defined by the selection of containers. The most popular idea is using clear vessels as it allows guests to experience a visual treat as well. M&Ms, candy apples, Jordan almonds, chocolate bars, mints, and Hershey Kisses are popular bride favorites. The color red is the color of passion and power, as well as romantic, elegant, dramatic, and luxurious. For that reason, you may like the idea of picking apples as part of your wedding favors, and if you do make it delicious. The details of how to present apples may be too overwhelming, prompting us to tuck that idea away for another time. 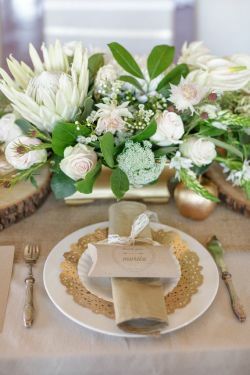 We encourage you to take an artful approach in planning, organizing, and creating a wedding favor that is the apple of your eye. Marry some of your ideas with some that we have found, and you will be on your way to celebrating your love and thankfulness with family and friends. Jordan almonds are sugarcoated candies that are rich in cultural meaning and wedding tradition. While tradition holds that Jordan almonds be presented in odd numbers, it is up to you to make the presentation as memorable as the history. Health, Wealth, Longevity, Fertility & Happiness. Yes it's true, it's what's inside that counts. But, when gifting chocolate bars as wedding favors, the outside matters too. Nothing says welcome more eloquently than a personalized wrapper sweetened up with eye catching color and embracing design. 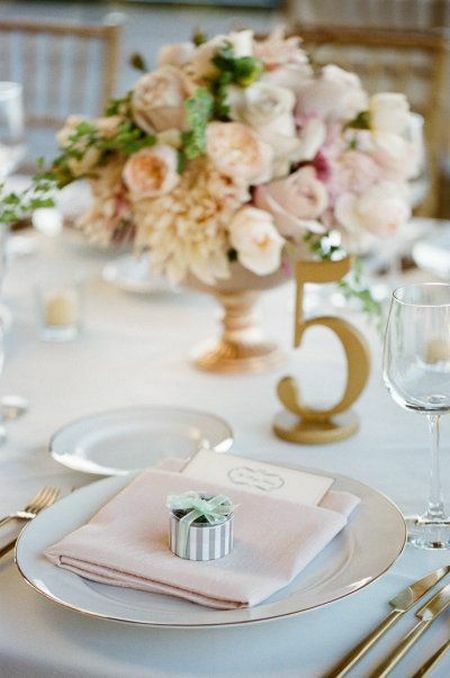 Offer your guests true hospitality that is deceptively simple and sweet as can be. Nothing says "thank you" like M&Ms chocolate candies, especially with the variety of colors and unique personalized touches available. 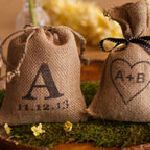 Whether it's a little tulle bag, a prettily wrapped box, or vessels filled with M&Ms, the honored tradition of wedding favors is well represented. Mint to be a thoughtful gift. 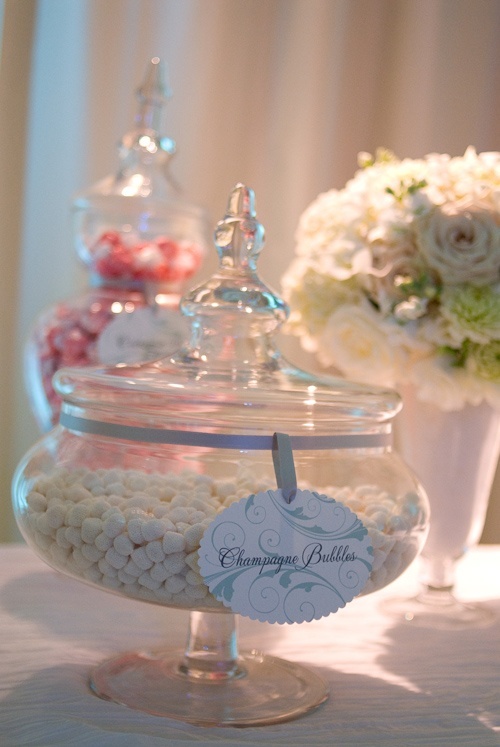 Mints are a classic way to say thanks for celebrating your special day and complimenting the theme of your wedding. Mint wedding favors can be personalized with names, dates, and even a photo. Look for unique ways to inject you and the groom's personalities into your favors. 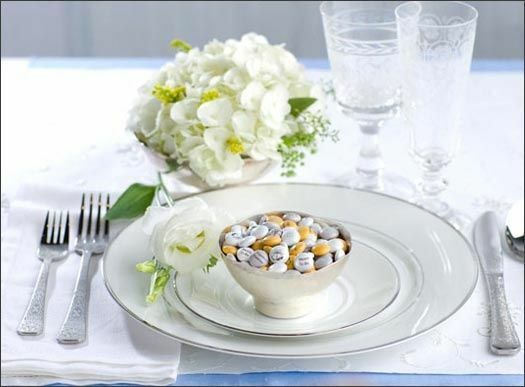 Mints are a tasty and delightful treat for the guest's tables. 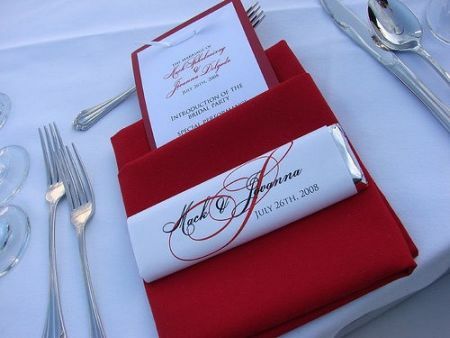 Give favors that let guests know you and your groom are meant to be forever. 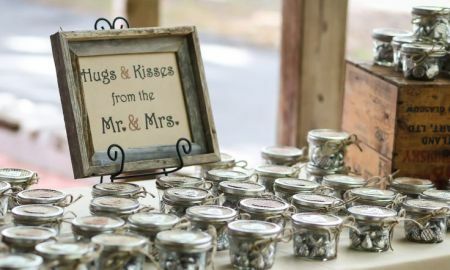 Of all the candy wedding favors available, Hershey Kisses tend to be appreciated more for their good looks and familiarity than anything else. It makes sense then to include Hugs & Kisses from the Mr. & Mrs. Kiss and tell your guests thank-you with a Hershey Kiss wedding favor that concentrates on fun, fanciful, and fantastic. The spirit of candy wedding favors is exemplified with a bubblegum ending to a wonderful day. 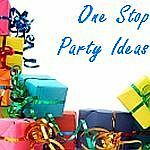 Think like a kid again by adding bubblegum favors that give grown-ups permission to indulge as well as kids. There are so many creative things that a couple can do with bubblegum wedding favors, and this playful idea honors the happy couple. 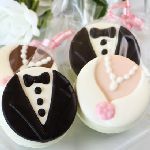 Bubblegum buddies are gumballs decorated with gourmet icing to replicate the bride and groom. How sweet. Gourmet chocolate and weddings go hand in hand. For years, chocolate has been considered the gift of love and romance. This scrumptious confection is given to ones we consider to be very special. Let guests know how special they are with this symbolic way of saying thank you. 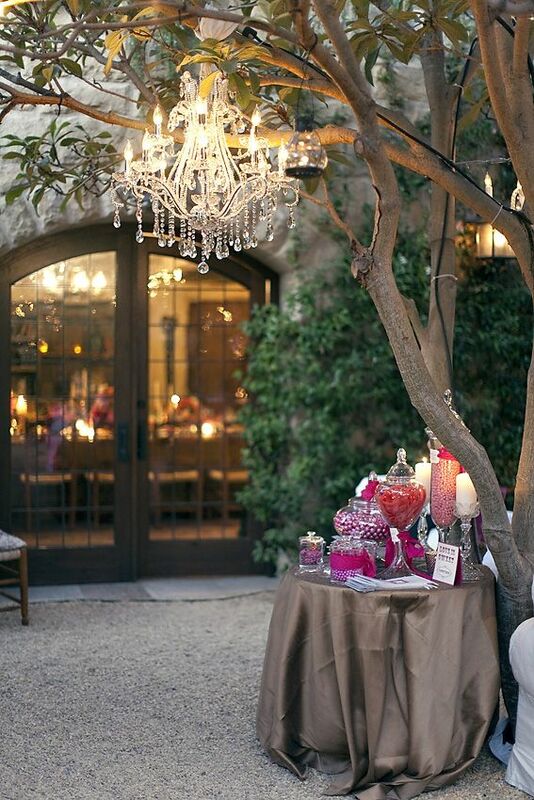 There are endless options for integrating this delicious candy into your favors with countless display ideas. We hope to take the fear out of presentation with creative ideas that will leave your guests speechless. So if you have a desire for the finer things in life, unwrap chocolate. It's as much a feast for the eyes as it is for the mouth. Your gifts will be a little sweeter with gourmet chocolate wedding favors. Are you puzzled as to what to give your guests? Let chocolate puzzle wedding favors be your solution. A chocolate puzzle is like an edible piece of art with all the pieces fitting perfectly together. You can choose from several whimsical designs or keep it simple with a single chocolate puzzle piece. Consider carrying the theme further with a puzzle guestbook. 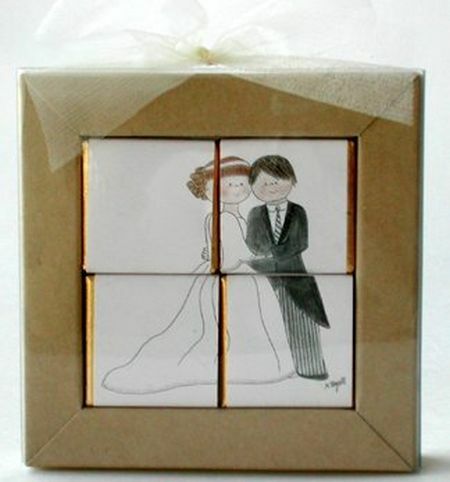 Have guests sign or write messages on puzzle pieces and then frame it later. Let the celebration begin with these white, grape flavored candy jellies covered with nonpareils. Candy wedding favors are so versatile. Champagne bubble candy adds a sophisticated flair to an upscale event, yet playful enough to compliment a more casual theme. Here comes the bride. Champagne bubble candy could be considered the bride of the candy buffet. The white color and delicate appeal are captivating. Pop the cork of your imagination. Have fun experimenting with your favor presentation. You will find a world of accent possibilities with clever packaging to capture guest's attention.